PC Motors started in 2006 as a motorcycle restoration outfit, restoring rare, collectable, sentimental, and classic Harley-Davidson motorcycles. We have since developed into a full service distributor of aftermarket performance parts for Harley-Davidson motorcycles and custom applications. We specialize in selling aftermarket Harley-Davidson engines, transmissions, primaries, and other driveline components at wholesale prices. We aspire to carry the best performing and highest quality parts available in order to make your motorcycle look and run perfectly. PC Motors is an official authorized dealer for American Suspension, BAKER Drivetrain, Belt Drives Ltd, Grandeur Cycle, JIMS USA, S&S Cycle, TP Engineering, and ULTIMA Products. We are currently in the process of partnering with other major aftermarket Harley-Davidson motorcycle parts manufacturers and suppliers. Click on the manufacturer tabs to view product photos, descriptions, specifications, and prices. Visit our Policies page for payment terms, shipping procedures, warranty information, and return policies. Download PDF files of product instructions and installation sheets by visiting our Downloads page. Browse our suppliers' online catalogs and websites on our Links page to help you pick out the exact parts you need to complete your project. Our knowledgeable sales staff will assist you with any questions that you may have. 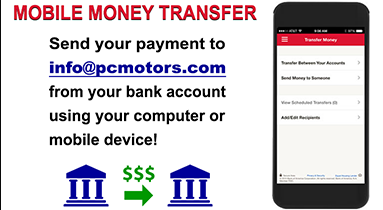 Please contact us at any time by filling out the form on our Contact page, or by sending an email to info@pcmotors.com, and you will receive a reply by email within one business day. To speak to a live customer service representative, please call 1-860-760-0403 during our normal business hours (Monday - Friday 9:00a.m. - 5:00p.m. EST). For information regarding PAYMENT OPTIONS AND INSTRUCTIONS, please visit our Contact or Policies pages.